I did it. 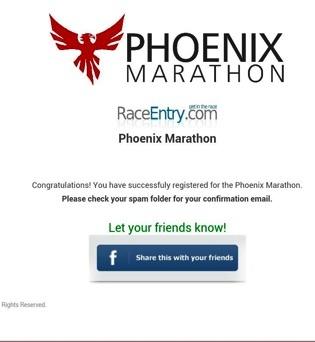 I signed up for a full marathon. I knew this day would come. I wasn’t sure how soon and I definitely didn’t think I’d consider running 26.2 miles 7 months after giving birth to my son. Don’t they say it took 9 months to create a child, you should at least give yourself that much time to recover? Clearly, I’m crazy. I also have crazy friends. I wouldn’t have been able to click that submit button had it not been for my running pal Salt. This is a person who is as crazy about running as I am. You need friends like that as a runner. Someone who is unfazed by the decisions you make however irrational they may be—they’re still going to cheer you on regardless. Along with Salty, I’ve got an amazing support group. Her and I are in a pretty awesome moms’ workout group online and these women are so inspirational. They are single-handedly what has motivated me to fall deeper in love with running. Every mom has a different story, a different, unique life but our goal is the same—to be healthy. This goal unites us and as the days pass, it is amazing to see how each woman transforms physically and mentally. This marathon will be for them. This marathon will be for the moms who care about being healthy for their families and for themselves. This marathon will be for the moms who work all day and then come home and cook and clean and wash clothes and tuck children in and then go work out. For the moms who wake up before the sun to work out. For the moms who stay home all day like me, running around after their kids and somehow finding the time to work out. This marathon is for the moms who don’t think they can do something like this. You are going to be amazing, I am SO excited for you!